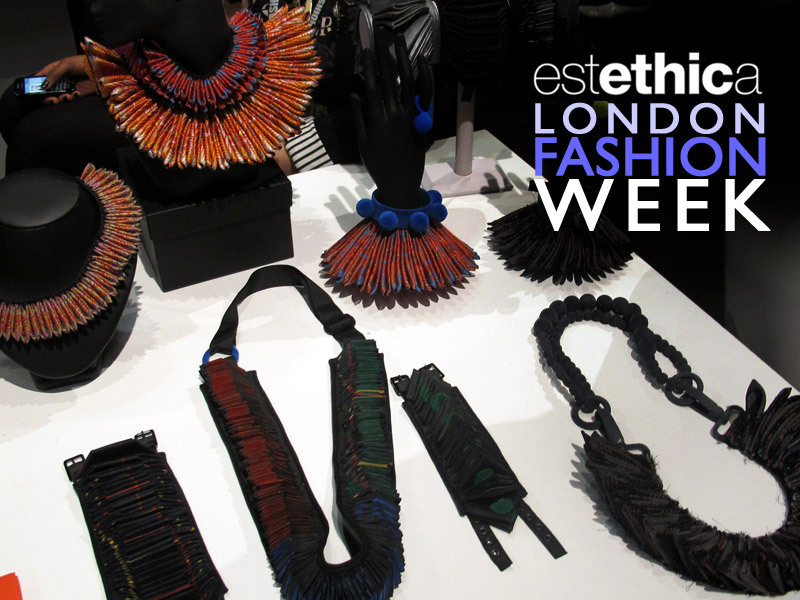 Estethica was in full swing as the place to spot sustainable design at London Fashion Week. Returning for its 10th season, the fashion platform made for a formidable presence at Somerset House, where it featured a mix of familiar names and emerging talent. Among them was Michelle Lowe-Holder (above), who showed a new collection of accessories made from fabric offcuts from her apparel-design past. For Autumn/Winter 2011, Lowe-Holder added velvet flocking to her ribbon art. For the past 10 seasons, London Fashion Week’s Estethica showcase has prided itself for nurturing ethical fashion design in Britain and abroad. Estethica returned to London Fashion Week for its 10th season. The designers are selected by a British Fashion Council panel the includes Estethica founders Anna Orsini, Filippo Ricci and Orsola de Castro, as well as Liberty of London’s Yasmin Sewell and Allanna McAspurn from Made-By. To qualify, designers have to adhere to one or more sustainable-fashion principles, whether it’s fair or ethical trade, recycling/repurposing, or man-made/eco-friendly fabrics. In addition, exhibitors have to have a minimum of two stockists, and be both business-focused and design-led. Browse our slideshow for 14 of our favorites from Estethica’s Autumn/Winter 2011 season. Estethica is co-curated by Orsola de Castro, founder of the ethical label From Somewhere. The collection, made from reclaimed fabrics from the factory floors of luxury fashion brands, features sumptuous cashmeres, printed wool jerseys, and silk chiffons. De Castro also presented the latest designs from the label's Speedo collaboration. Kurt Williams and Cornelius Brady of Junky Styling dipped their toes into menswear this season. Their Autumn/Winter 2011 collection comprises two parts: an assortment of signature Junky pieces inspired by their archives, as well as Ju.St., a new line that combines edgy design with the label's trademark suiting fabrics. The Environmental Justice Foundation debuted its exclusive Climate Week T-shirt, designed by Eley Kishimoto. Available for just £10 at Tesco, the organic-cotton tee has already been modeled by the likes of professional clotheshorse Lily Cole and actresses Gemma Arterton and Gillian Anderson. Ethical fashion pioneer Sarah Ratty feted her latest collection for Ciel, including two gorgeous new prints in green and pink. 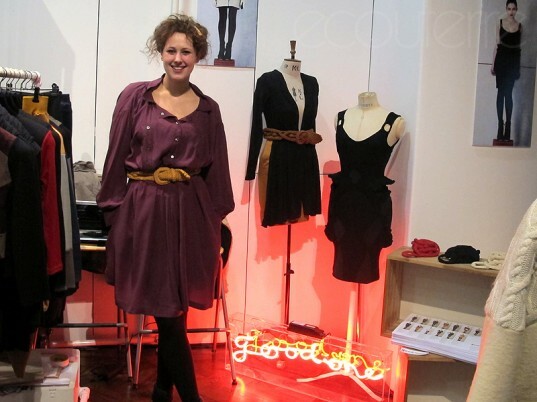 Nin Castle, the award-wining designer behind Goodone, presented her Autumn/Winter 2011 collection. In addition to Castle's signature paneled dresses and color-block sweaters, Goodone is offering silk shirts, blanket coats, and statement-making little black dresses. Fresh from her stunning New York Fashion Week presentation, Tara St. James of Study NY and The Uniform Project was a welcome addition to Estethica. Her Fall/Winter 2011 collection, which was inspired by her mother's wardrobe during her childhood in Montreal, was a huge hit with the London crowd. Jeweler Joanna Cave presented her stunning and intricate new collection, which she says is inspired by the "interplay between the dynamism and the apparent fragility of classical ballet." Art Nouveau patterns feature heavily in the hand-cut designs. She also introduced some beautiful headpieces for the season. Emesha's Emese Nagy presented press and buyers with her Autumn/Winter 2011 collection, which marries the androgynous shape of the shirt with pleats and tessellation. Produced in Hungary, the stunning lineup features organic and natural fibers. Although Christopher Raeburn now holds court at the NEWGEN part of London Fashion Week, Estethica wouldn't be the same without him. To make up for his absence, Raeburn installed giant reclaimed-fabric bunnies—inspired by his Christopher Raebbits, perhaps?—throughout the space. Eleanor Dorrien-Smith presented her second Autumn/Winter collection for Partimi. Entitled "Garden," the range draws liberally from old photographs of her father and auntie playing together as children. Director Will Dorrien-Smith made a haunting film to accompany the pieces. The North Circular, the wool-based label founded by models Lily Cole and Katherine Poulton, returned to Estethica with its flock of happy knits, as well as new promotional film starring Cole. We photographed Henrietta Ludgate (right) with Chrystau Anne Holgate, the face of her eponymous brand. The stunning Autumn/Winter 2011 collection features Ludgate's signature sculptural style, mixed with heavy knits and studded embellishments. Jacob James, a new addition to Estethica, is on a mission to keep our heads warm next winter. The collection consists of two contrasting materials: Eco-fi felt, derived from recycled plastic bottles, and a fabric made from stinging nettles, grown and manufactured in the U.K.